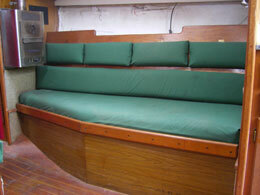 John Bougearel is offering his 1973 Seafarer 34 for free to a good home. He has been unable to sell Seaquest and would like to see her moved to a new home and stored there before winter sets in. Seaquest is located in Michigan City, Indiana, at the southern tip of Lake Michigan. 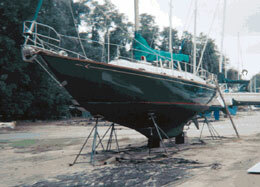 A 2003 survey appraised the boat at $27,000, when it still needed a fix on the rudder and a fix on the starboard deck. 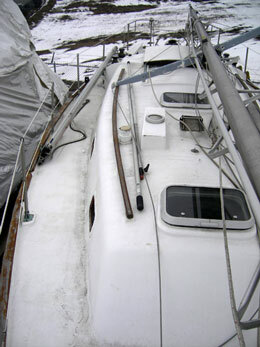 Both those repairs have been done, plus a new headsail and roller furling system indicates the boat is every bit of good condition it was in in 2003 if not better. The boat is now rigged as a sloop, not as a yawl. The headsail is new, the main is not new and is sized for a yawl, so a bit small for a sloop rigging. The cockpit needs a sanding and repainting and there is a small soft patch on the starboard deck that I repaired, but need to sand a smidge and paint. 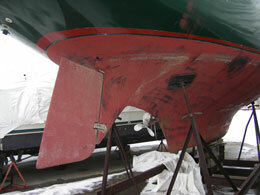 With the boat on the hard since 2009, the diesel fuel needs to be removed and the tank cleaned/scrubbed. Other than that, she is serviceable, in great shape, and just in need of its regular maintenance. For further information and more photos, John can be contacted at: jb2@structurallogic2.com, 312-618-2290. Here's wishing everyone a beautiful fall season!